The Centre for Feminist Research, in collaboration with the Sexuality Studies Program and the Graduate Program in Gender, Feminist and Women’s Studies at York University, is co-organizing the 2017 Summer Institute in Sexuality Studies (SISS). Over the course of five days, the participants will engage in lectures, master classes, roundtables and creative workshops using a wide variety of approaches to consider the intersections of perversion, psychoanalysis, queer theory, and race. By bringing together internationally renowned lecturers and graduate students from a variety of disciplinary and geographical backgrounds, the Summer Institute provides an international and multidisciplinary platform for learning, sharing and developing research and theory in the area of sexuality studies. 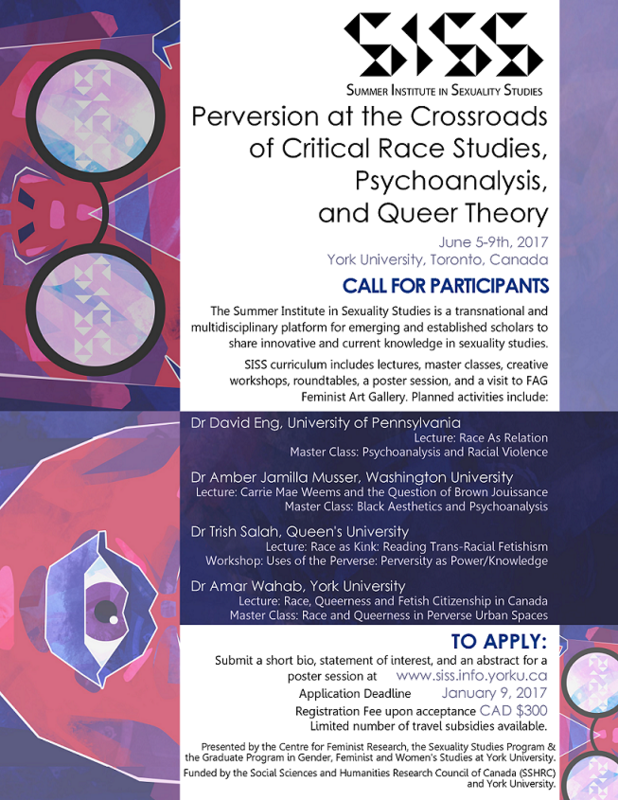 The inaugural Summer Institute's theme is Perversion at the Crossroads of Critical Race Studies, Psychoanalysis, and Queer Theory. The Institute’s Coordinating Committee is comprised of Daria Davydova (PhD, GFWS) and Toby B.D. 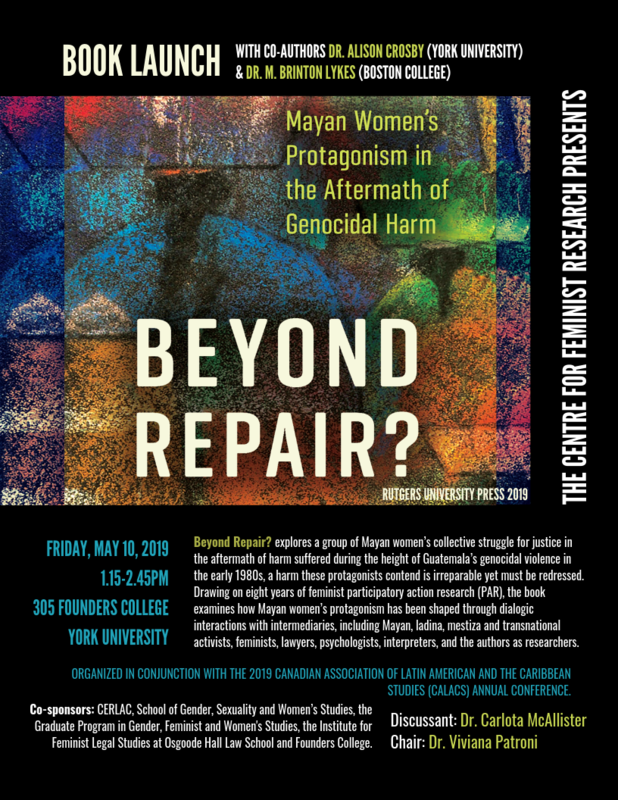 Wiggins (PhD, GFWS) as the Institute’s co-Coordinators, Institute Director Dr. Amar Wahab, CFR Director Dr. Alison Crosby, CFR Coordinator Julia Pyryeskina, GFWS Director Dr. Enakshi Dua, and Sexuality Studies Coordinator Dr. Allyson Mitchell. The Institute is generously supported by a Connection Grant from the Social Sciences and Humanities Research Council of Canada (SSHRC), as well as by York University, including: the Office of the Vice-President Academic; the Office of the Vice-President for Research and Innovation; the Faculty of Education; the Faculty of Liberal Arts & Professional Studies; the Faculty of Graduate Studies; the Graduate Program in Gender, Feminist and Women’s Studies; the School of Gender, Sexuality and Women’s Studies; Glendon Gender and Women’s Studies Program; the Sexuality Studies Program; Institute for Feminist Legal Studies at Osgoode Hall Law School, Graduate Program in Social and Political Thought; Department of Anthropology; Department of History; Department of Political Science; Department of Social Science; and the Centre for Feminist Research. Masters and doctoral students in a wide variety of disciplines are invited to apply. An application form is required, and some travel subsidies are available.